Spanish Point is a collective name for the coastal region of three townlands –Breaffa South, Legard South, and Dough. These three townlands replaced four older land divisions- Breaffa West, Spanish Point, Doughbeg, and Doughmore. It is bounded to the north by the Clonbony River to the south by the Annagh River while the whole of its western boundary is fronted by the Atlantic Ocean on the Wild Atlantic Way. Our place name dates back to 1588 when two ships of the Spanish Armada were wrecked off the coast here. According to local folk memory many of those drowned and the few survivors executed by Boetius Clancy the sheriff of Clare were buried in a common grave at a place referred to locally as Tuama na Spainneach. The earliest development of the locality began in 1712 when Thomas Morony took a lease of land here in West Clare then referred to as Poulawillin at a rental of £90 per annum from the Earl of Thomond. This land was then purchased in 1750 by Thomas’s eldest son Edmund. It was then divided into two farms and set on thirty one year leases to two local landlords. 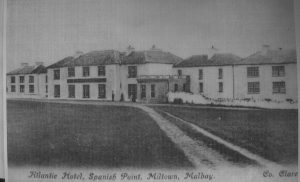 When the leases expired, Edmunds eldest son also named Thomas decided to come to Spanish Point with his family where he built Miltown House and established the Miltown House Estate. He then commenced developing his estate dividing it into two settlements Miltown Malbay and Spanish Point, the former to a town plan. He quickly saw the potential of his beautiful seaside location encouraging friends to come and build saltwater lodges, Morony providing the sites. In 1808 he united with other adventurers to draw up plans to build a Hotel and Tepid Baths which when built was for a short period referred to as “the largest hotel in the British Isles”. This complex which also contained a large square of stables, the Atlantic Hotel, and Tepid Baths attracted wealthy visitors to Spanish Point to benefit from the fresh sea water baths and seaweed baths. He also set in train steeplechase racing on his own lands which quickly became the most popular meeting in Munster. In Spanish Point he also built houses for his own sons and daughters adjacent to the hotel. The Atlantic Hotel became the centrepiece of early nineteenth century tourism along the scenic Clare coastline due to its central location when horse drawn carriages were the norm. Though never managed directly by the Morony family it was leased and run by a number different proprietors except during the Famine when it was used as an Auxiliary Workhouse. Again during the disturbed decade of the Land War and Plan of Campaign when the landlady Eleanor Morony clashed with her tenants over land related issues her hotel was used as a military barracks and as a “Boycott Shop”. Morony’s descendants continued to manage the estate until it was purchased by the Congested District Board between 1917 and 1919, though much of the Spanish Point house property was sold as a single lot to a property speculator. The land and house property on the remainder of the estate was sold off to the occupying tenants. 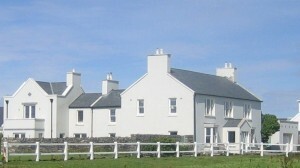 The Atlantic Hotel was built by the Baths Company which had been established by members of the Morony family and other adventurers for the purpose of building a Hotel and Tepid Baths at Spanish Point. It opened for business in June 1809 under the management of David Anderson. Its clientele comprised mainly of the gentry and clergy of Clare, Limerick and Tipperary but later extended nationally, to England, and the Continent of Europe. It had beds for seventy guests and stabling for sixty horses. During the famine it was leased by Burdett Morony together with his farmhouse at Parknalassa to the Ennistymon Board of Guardians as an Auxiliary Workhouse and Fever Hospital. It was later leased to a number of different proprietors and run as a high end Hotel, before becoming an Army Barracks during the Land War. It was from here landlady Eleanor Morony ran an infamous “Boycott Shop” in the late 1880’s. With the arrival of golf to West Clare in the 1892 a nine hole golf course was added as an amenity for guests who also had the option of tennis, croquet, and bowling. It ceased to function as a hotel in the mid 1930’s but continued to be leased to a religious order as a summer retreat. Most of the hotel ruin was demolished in the 1940’s except for west end which continued to function as licensed premises until the mid 1950’s when the licence was transferred to a single storey corrugated roofed premises and rebranded the “Armada Bar”. This has now developed into the Armada Hotel. 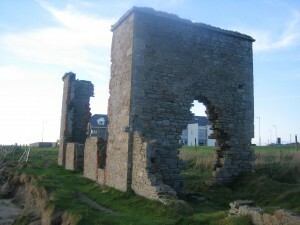 Ruin of the Old Atlantic Hotel Spanish Point which opened for business in 1809. 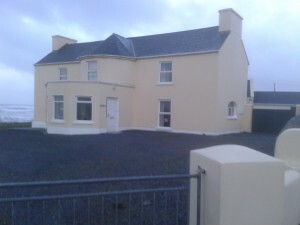 Seaview House was built by Frank Gould Morony formerly of Miltown House circa 1830 replacing an older building. In the 1870’s the house was inherited by the Ellis family who added the two wings to the building. The house was sold to the Sisters of Mercy in 1929 where they opened Saint Joseph’s convent secondary school here. Later following the building of a new school at Miltown House in 1958 it was used as a girls’ boarding house. Prior to that, it housed the nuns with limited accommodation for boarders. It later came into the ownership of Clare Social Services who renamed it “Mother Macaulay House”. This house has recently changed ownership. 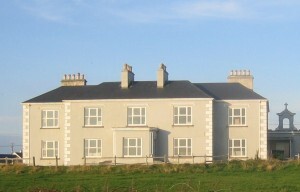 The Billows or formerly Billowville was built circa 1810 as a seaside residence for the D’Esterre family who resided near Sixmilebridge. The “Billowville” Morony’s leased this house from Eliza D’Esterre in the mid 1850’s. It was later purchased by the Barrington family using it as a permanent residence. 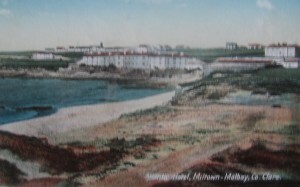 In the 1930’s it was converted into a small family run hotel later becoming an annex to the Marino Hotel on strandline. It was purchased by the Bishop of Limerick in the early 1950’s as a holiday house for the Presentation Order of Nuns. Comerfords Lodge now named Clare Cottage. 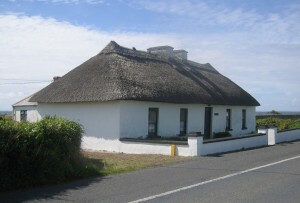 This pre famine thatched cottage was owned by the Comerford family, one of whom established licensed premises at Doonbeg. Another member of this family Henry Comerford was the owner of the famine ship “The Brig St. John” which sank at Cohasset off the coast Massachusetts in October 1849, while another brother Isaac was a crew member. Over one hundred of the passengers drowned many from the North Clare area. Henry having married into the McDonaghs a well known business family from Galway was a relative Padraig O Conaire and died at Ballykeale House, Kilfenora in 1861. In 1900 it was occupied by Lizzy and Margaret Comerford who ran Spanish Point Post Office here for many years. It was in the vicinity of this house that the earliest village grew up around Spanish Point and the first post office to service both Spanish Point and Miltown Malbay was nearby. (see photograph below) In more recent times this house has been used by a number of different proprietors as a summer residence and renamed “Clare Cottage”. 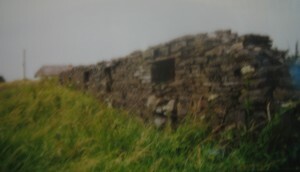 The ruins of the pre famine village at Spanish Point with Comerfords’ Lodge in the background. Built as a residence for the extended Morony family it was let on short term leases to the occupier of the post of Miltown Malbay Dispensary doctor. In the 1870’s Robert Morony and his wife Kate Rose with their large family lived here. It transferred through marriage to the White family. The last surviving member of the White’s, Moira, sold the property to Lord and Lady Averil Swinfen in the 1960’s where they established a famous donkey stud. In 1978 it was purchased by the Dave Ackroyd whose family still reside here. Armada Lodge also Eller’s Lodge. Armada Lodge is probably one of the oldest lodges in Spanish Point village. It was near here the first settlement of local people settled in what was then called Breaffa West. This town land has been renamed Breaffa South since 1839. The outline of doors and windows of the seven pre famine stone residences can still be identified along the stone boundary walls. This road also leads to the reclaimed Kelp Pits, the Kelp ship wreck site known as “The Ship” as well as Tuama na Spainneach. According to local memory and folklore it is here the bodies of the Spanish sailors – those who drowned and executed by hanging are buried in a common grave. This event gives our village its place name Spanish Point. The wreck of the S.S. Kelp at Spanish Point. On 4 January 1916 the residents of Spanish Point were confronted with a life and death scenario, in the teeth of an Atlantic storm that was battering the exposed coastline of West Clare. Nine crew members of a small steel hulled schooner found themselves at the mercy of the rocks at an area known locally as the Point at the “Cross Sea” in the townland of Breaffa South Spanish Point. (Known as the “Cross Sea”due to the anger and ferocity of the Atlantic swells even on a calm day.) But for the swift and brave actions of a group of local small farmers, it is likely that all the crew would have been lost within hours of the vessel’s grounding. The S.S.Kelp was a relatively new vessel she was originally built in the Netherlands and was quickly absorbed into the Imperial German Merchant Marine. 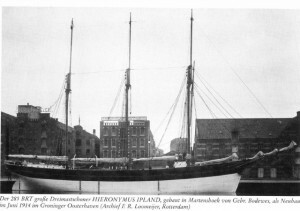 On acquiring a German registration she was renamed the S.S. Pax and sailed from Bremen bound for South America on 6 June 1914. The Pax reached Buenos Aires in the early autumn 1914 unaware of the incredible events happening in Europe. On departing the harbour there she was intercepted by the Royal Navy cruiser H.M.S. Glasgow who arrested her for illegally flying an Argentinean flag and deemed her a prize of war. She was renamed the S.S. Kelp and loaded with tallow bacon and hides bound for London, leaving Port Stanley on 27 September 1915. On reaching Malbay off the West Clare coastline around Christmas Eve 1915 she encountered equipment failures and on the morning 4 January 1916 she was beached on the rocks at the navigation headland Spanish Point. The local men immediately sprang to the aid of the stranded schooner’s crew. Those involved in the rescue were Michael Quinn, James Boland, John Treacy, Martin Griffin, and Marty Morrissey. Despite the mountainous swells raging at the time all the crew were saved with the exception of William Johnson a native of Denmark. The cargo was later shipped to Kilrush on the West Clare Railway where it was sold by public auction. The wreck remained at the Cross Sea for another thirty years until it was cut up and removed during the “Emergency”. The “gough” or inlet where the ship was wrecked is still known locally as “The Ship”. This house was built in the 1830's for Thomas Morony's eldest daughter Charlotte. Local folklore says it was built in sand and sinks an inch every year. 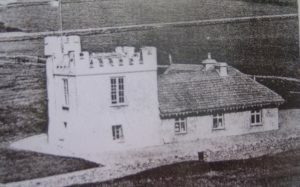 Following the marriage of Thomas Morony Junior to Anna Maria Dartnell in 1833 the Dartnell family purchased the Retreat as a marine lodge. In 1855 it was occupied by George Alps Dartnell a Limerick solicitor and when Charlotte Barclay (nee Morony) was widowed she married George Dartnell as her second husband. The Retreat was inherited by Robert Burdett Barclay one of the founder members of Spanish Point Golf Club. In the 1930's it was sold to the Parker-Hutchison's a Tipperary family and later by the Parker Price family. In the 1960's it was occupied by the Leckibush familly when he managed the labels factory in the Ballard Road, Miltown Malbay. The complete article can be seen in Dr. Patrick Hillery Library in Miltown Malbay. The Indian Summer of 1934, tempted many bathers into the calm waters of Spanish Point, Miltown Malbay, Co. Clare. Saturday, September 15th. was a particularly pleasant day, however, the undercurrent proved menacing and a local resident got into difficulty and tragically did not respond to resuscitation and was pronounced dead by a local doctor. News of yet another drowning tragedy, a frequent occurrence along the beaches on all Irish coasts, shocked not just the local community but the population at large. Shortly afterwards, a group of concerned locals decided to do something about it. A fund raising committee was formed and its aim was to raise funds to purchase lifesaving apparatus, the type which was already in use on beaches in Great Britain and on the continent. Silver Strand, Miltown Malbay, with modern Life-Saving Apparatus. Mr. Ryan, National Bank, Hon. Treas. Mr. P.J. Hurley, Hon. Sec. HELP A GOOD CAUSE -------------------- DO IT NOW! The members of the committee outlined in the circular above, formed a broad representation of the population living in the Miltown Malbay area at that time and included many members of the Anglican, Church of Ireland community – many of whom lived in Spanish Point. Five hundred circulars were printed at a cost of 10/- (ten shillings) and a young boy was given 6d to deliver most of them to homes in the town and its environs. P.J. Hurley drew up a list of approximately two hundred names and included in this were the names of locals who had moved to other parts of Ireland; people who holidayed regularly in the area and included many religious communities and clergy from the Dioceses of Killaloe and Limerick; friends and business contacts. A circular was posted to each. The response was immediate and generous. Contributions arrived from all quarters and from people from all walks of life and of religious beliefs. The contributions ranged from 1/- to 2 guineas and the average contribution was approximately 5/-. By late October 1935, three lifelines, each made up of a harness, float and portable reel with rope, were purchased. Concrete beds on which to place them were made. Shelters in which to place them were erected at Spanish Point and at The Silver Strand (more commonly referred to as the White Stand). The total cost of supplying and installing the apparatus at the beaches was £39-18-0. This lifesaving equipment was relatively new in the Irish State, and formal training in the use of this equipment at beaches, was not readily available. The strong swimmers living locally, were happy to be on duty on a voluntary basis during the summer seasons of 1936 and 1937. It was not until 1937, that lifeguarding at beaches was introduced in a structured way and again, Miltown Malbay led the way. The Lifesaving Apparatus, now in place at Spanish Point and the White Strand, Miltown Malbay, since late 1935, was a much valued resource in the community and was put to good use during the 1936 and 1937 summer seasons. However, there was concern regarding the availability of instruction in the skills of lifesaving using this new equipment. Mr. John Quinn of Clare Co. Council, was approached for help in this matter. He had a very keen interest in furthering developments in the saving of lives at Co. Clare beaches. He played a very important role in sanctioning the provision of lifesaving equipment similar to that already in use in Miltown Malbay from an earlier date, to other beaches in Clare. He was secretary of The Public Health and Public Assistance Section and was aware of the many lives lost in drowning accidents in the County. Detective Officer Harry Gillespie of the Garda Siochána and working in the Ennis area, was identified by John Quinn as the person best suited to instruct swimmers in the required skills. He was from Northern Ireland and was fully acquainted with the necessary techniques involved. A meeting was called of the people of Miltown Malbay in the Parochial Hall on September 17th. 1937 and Sergeant Gillespie was invited to attend. Mr. P.J. Hurley was the secretary and Mr. E. J. Carroll, chairman. The question of forming a branch of the Irish Lifesaving society was considered and after a long discussion, it was decided unanimously that this should be done. An organising committee was formed and Detective Gillespie gave a commitment to attend and give land drill instructions to those swimmers who intended joining the club. Many hours were spent training in the Parochial Hall and at the White Strand. It is worth noting that again, as in the initial fundraising committee of 1935, the members of the Swimming and Lifesaving Club committee represented the general population of the area and included swimmers, local clergy, doctors, gardaí, teachers and other members of the general public. Noteworthy also, the lifeguards who patrolled the beaches at Spanish Point, the White Strand and other beaches in Clare, were the first in the country to be remunerated for their work. Many of the early members of the Club served on many beaches in the county and also became certified instructors and examiners. Many of these who moved to other parts, helped to found other clubs. P.J. Hurley was the first elected President of the Swimming and Lifesaving association of Co. Clare. John Sullivan. The green flag was flying proudly over the Lifeguards’ Hut. The club continued to raise funds by holding many public events including several dances a year in the Parochial Hall and Flag Days.